Bob McDonald kicks off this year's LMC with "Science As I've Seen It"
Bob McDonald, award-winning and beloved Canadian science personality, gave a fantastic lecture yesterday, “Science as I’ve Seen It” to kick off the 2011/2012 Lectures in Modern Chemistry series. Bob kept the 300+ audience entertained as he recounted experiences spanning his 35-year career as a science journalist; transporting the audience all the way from Mars – millions of kilometers away – to the Sudbury Neutrino Observatory 6,800 feet below the Earth’s surface. His emphasis on Canadian scientific discoveries and research throughout the presentation instilled a strong sense of national pride. The lecture addressed an important issue faced by many in the scientific community - how can a scientist communicate what they do in a way that the public will understand? Bob’s answer: focus on the “why”, use analogies and try to speak in layman’s terms. 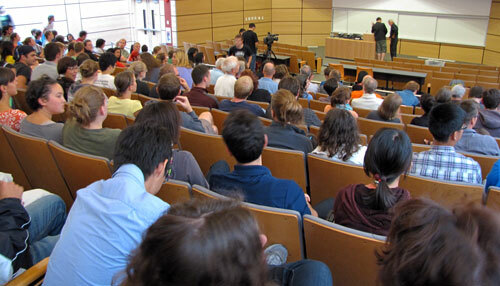 He imparted the audience with the challenge of discovering ways to get the word out to about science. Bob also kept it light with video footage of his experience in a g-force plane, impression of a human on the moon without a spacesuit, and his crack at the unlucky CBC journalists who have to report on Parliament Hill. Bob McDonald hosts the CBC radio show Quirks & Quarks, is science commentator for CBC news, a published author, and was host of the children’s television shows Head’s Up! and Wonderstruck. 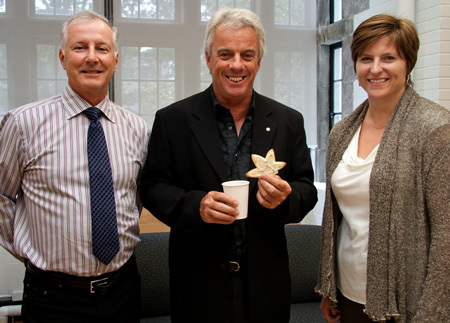 He was recently awarded the Order of Canada for his important contribution to the public understanding of science. 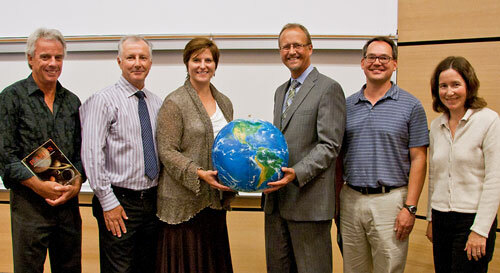 The event was organized by Dr. Laurel Schafer and hosted by the Chemistry Department. Co-sponsors included the Faculty of Science, Department of Botany, Department of Earth and Ocean Sciences, Department of Physics and Astronomy, and the Department of Zoology. 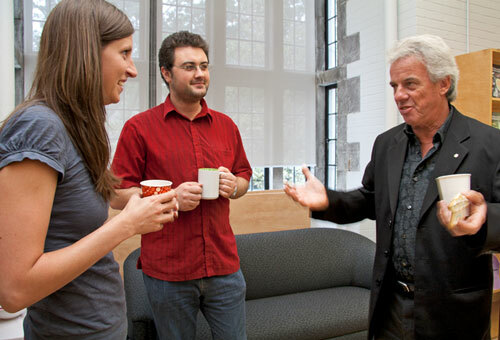 Prior to the lecture, chemistry graduate students had the chance to experience a smaller and more intimate session with Bob in the graduate student lounge during a special “Coffee Time” put on by the Chemistry Graduate Society (CGS). A meet-and-greet after the lecture also gave patrons the chance to get up close with Bob in the foyer of the brand new Centre for Interactive Research on Sustainability (CIRS).